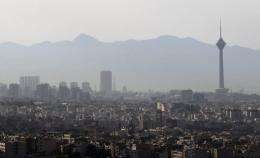 A general view of Tehran early in July 2011. The United States on Tuesday opened a virtual online embassy to reach out to Iranians despite the absence of official ties, vowing to break through the Islamic regime's "electronic curtain." The United States on Tuesday opened a virtual online embassy to reach out to Iranians despite the absence of official ties, vowing to break through the Islamic regime's "electronic curtain." Iranian authorities have already voiced anger over the virtual embassy, accusing the United States of seeking to interfere in the country after Secretary of State Hillary Clinton announced plans for the project in October. The virtual embassy, which went online Tuesday at http://iran.usembassy.gov, offers US policy statements in English and Farsi, information on US visas, news from US-funded Voice of America and links to share views via social media. In a welcome message on the website, Clinton voiced hope that the platform would provide a way for Americans and Iranians to communicate "openly and without fear." "Because the United States and Iran do not have diplomatic relations, we have missed some important opportunities for dialogue with you, the citizens of Iran," she said in a video message. "But today, we can use new technologies to bridge that gap and promote greater understanding between our two countries, and the peoples of each country, which is why we established this virtual embassy," she said. US officials invested in the website in hopes that it could withstand a cyber-attack, or at least be quickly put back online if it is taken down. State Departmet number three Wendy Sherman, introducing the website at a Washington news conference, said that the United States was seeking dialogue with ordinary Iranians despite "very strong differences" with the government. "The regime has tried to impose an electronic curtain by disrupting cell phones, the Internet and social media," said Sherman, the under secretary of state for political affairs. "This is one more effort to try and get around that curtain and get information directly to the Iranian people," she said. The virtual embassy will allow Iranians to download applications to start applications for visas to the United States. But Iranians will still need to go overseas, typically to Turkey or the United Arab Emirates, to obtain visas. The United States and Iran have not had diplomatic relations since the aftermath of the 1979 Islamic revolution, when protesters ousted the pro-Western shah and later seized the US embassy in Tehran. Is there any doubt that Bush went into the wrong country? Perhaps he had trouble with the spelling...Iran and Iraq are pretty close. He might have said, let's attack Iraq, not realizing it wasn't Iran? All joking aside, this isn't exactly a new concept. Radio Free Europe, Radio Free America, etc. Just an update (using the internet) on an old concept. And a very successful one at that.